I am finally back home after spending two weeks with my folks in Massachusetts. While there, I had signed up at a gym and had a couple of sessions with a trainer. At our first meeting she told me that she was going away for vacation the following week, and I told her that I was only there for another week. In order to get me started, she squeezed me in the next day before she was off for vacation. I thought it was really nice of her to do that, given I was from out of town and only visiting for a short time. So I thought it would be nice to leave her a Thank You note. I made a card, and left it at the gym this morning before leaving town. I inked up a white piece of card stock with distress inks (Picked Raspberry, Seedless Preserve and Spiced Marmalade). Once it was dry, I gold embossed the doilies from Wplus9 Damask Doilies at the top third. and then stamped the sentiment in black. Well, I didn’t like the way it looked, so I trimmed off a section from the top. I liked the cut off doilies much better than the whole ones. Finally, I matted the panel with shimmery gold vellum and popped it on the card base with foam tapes. That’s it! Thanks for stopping by! Your inking is flawless, so striking. Such a lovely gesture to leave a card!! Oh how sweet of you! I never think of doing things like that … I’m sure it made her day. Definitely love the partial gold doilies, good call. A real stunning, bold, yet clean, card. Love it! Well, what a gorgeous card – I am sure she loved it! This is such a gorgeous design! Love the warm colors.. so vibrant. The trimmed doilies worked out perfectly. I saw it when the page came up and I said outloud to no one ‘Oh I like that!’ It is gorgeous love the colours together. Such a lovely idea to do this, and what a stunning card!! 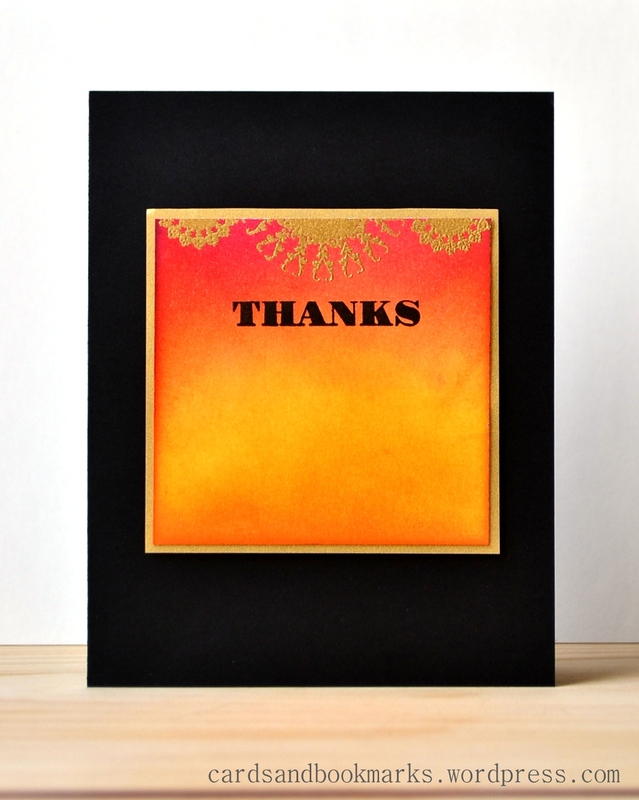 Love the blended background and the touch of gold embossing, all against the black makes for something quite dramatic and very gorgeous!! Your card has such a visual impact! The colors are amazing and really pop out from the black background. The golden touch is just perfect. Wow, that card looks so hot I think I got sunburn!! Such intense colour – absolutely stunning Tasnim. Don’t you love it when an idea comes to mind to “save” an idea gone awry? This is absolutely gorgeous and so nice of you.